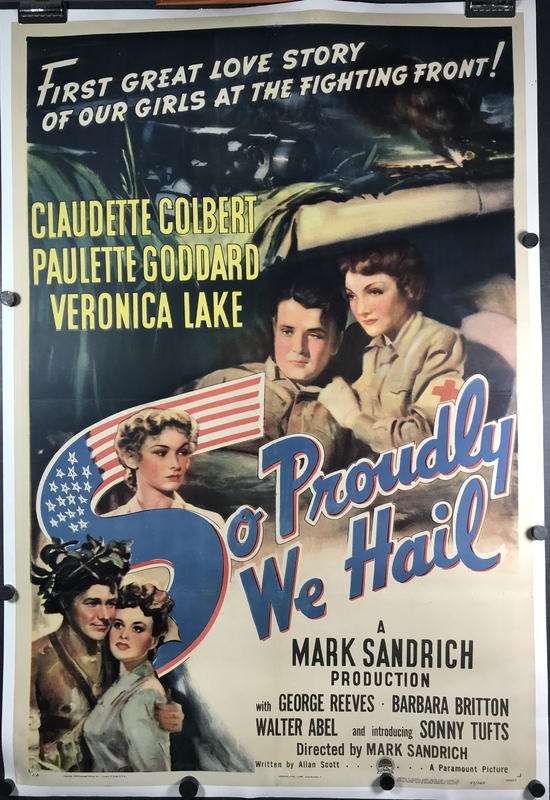 SO PROUDLY WE HAIL, Original WW2 Era movie poster. SO PROUDLY WE HAIL, 1943. Original One Sheet (27 x 41”), (89 x 125 cm) originally folded and now linen backed movie poster starring Claudette Colbert, Paulette Goddard and Veronica Lake. Directed and produced by Mark Sandrich. “First great love story of our girls at the fighting front!” The film was based, in part, on the memoir of Lieutenant Colonel Juanita Hipps. The story covers the every day brutality of war and the futile efforts to provide medical help and comfort by the military nurses. Veronica Lake and Paulette Goddard were both nominated for an Academy Award for Best Supporting Actress for their performances. Many Hollywood celebrities were active during WW2 by assisting with the War Bond Drives and making patriotic films. This poster is in C8 originally folded, and now linen backed condition with vivid colors. There is a piece of paper missing at he bottom left, the top rights of the poster, and a few spots on the bottom right fold line. Some retouching has been done along the fold lines.